I use internet lessons and web quests as a way to introduce certain topics and to reinforce others. Students will visit the website that is listed in the directions of the handout. From there, they read along and follow the directions on screen as well as the directions of the handout. A computer with access to the internet is needed to complete this lesson. 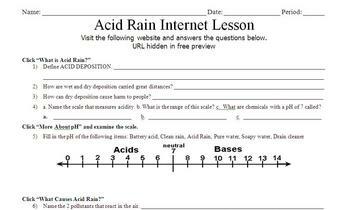 This is a nice way to learn about the history of acid rain, causes, and sollutions. Check out my other internet lessons (web quests) as well. I have created these for most topics common to high school biology.